Comparison of C. elegans fat storage using 2 different dye staining techniques. 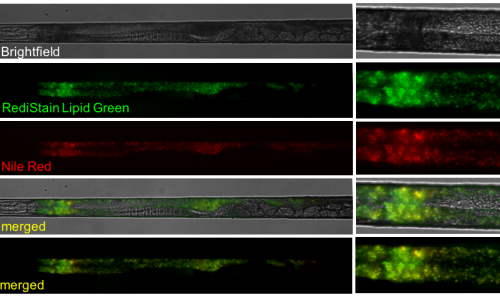 Intestinal and epidermal fat in an adult C. elegans has been stained using RediStain™ WormDye Lipid Green (B) and Nile Red (C). It takes 20 minutes to to stain live worms using WormDye Lipid Green vs. 3 days using Nile Red on plates. RediStain™ WormDye Lipid Green is an intrinsically lipophilic fluorophore that can be used to effectively track lipids inside C. elegans. When using Lipid Green, native lipid droplet morphology is preserved and fat content per body volume can be quantified in individual worms. The figure above shows comparison of C. elegans fat storage using 2 different dye staining techniques. 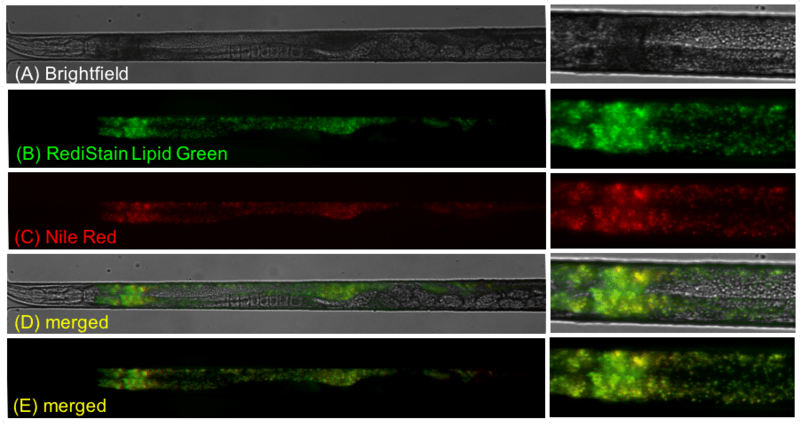 Intestinal and epidermal fat in an adult C. elegans has been stained using RediStain™ WormDye Lipid Green (B) and Nile Red (C). It takes 20 minutes stain live worms using WormDye Lipid Green vs. 3 days using Nile Red on plates. 1. Klapper M. et al. Fluorescence-based fixative and vital staining of lipid droplets in Caenorhabditis elegans reveal fat stores using microscopy and flow cytometry approaches. J. Lipid. Res. 52, 1281–1293 (2011). 2. Zhang S. O., Box A. C., Xu N., Le Men J., Yu J., et al. , 2010a Genetic and dietary regulation of lipid droplet expansion in Caenorhabditis elegans. Proc. Natl. Acad. Sci. USA 107: 4640–4645.